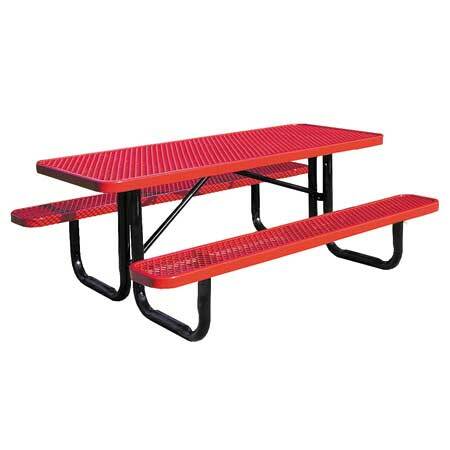 [XPB-TXXPXX] Rectangle Picnic Tables feature expanded metal tops and bench style seating. Table tops and seats are constructed 9 gauge expanded metal and are covered in Thermoplastic, a durable weather resistant coating available in 16 Color Choices (see Color Selects). Frames are constructed in 2-3/8" galvanized steel tubing and coated in a black powder protectant and available in Portable, Surface Mounted or In Ground Styles. Handicap Tables available in 8 ft. Portable and 8 ft. Surface Mount choices. Table is available in 4 ft., 6 ft., 8 ft., and 12 ft. lengths. Optional Anti-Skateboard Tabs sold separately. For shipping quotes, discount pricing, orders or questions please call our Customer Service Center at 1-877-483-9270.